1&1 Review UK 2019 - a definite nope! We'll recommend a better host instead! If you’re really on a budget and need some quick hosting to test something, sure, go ahead and sign up with 1&1. Their performance is decent enough, and the pricing is attractive. Unfortunately, that’s where the benefits seem to end. “Horrendous, unhelpful and dishonest”. That quote is straight from a user review that sums up about 40+ other reviews we’ve read… it’s fair to say their reputation isn’t at an all-time high at the moment. From pretty bad customer support (with staff that sometimes that barely speaks English), credit cards getting charged after the cancellation of services (quite a lot of complaints about this), to even locking accounts and taking domain names… if these are legit complaints, it’s pretty scary! So what we’re really saying is… there a lot of web hosts out there that are a lot better at pretty much everything. Our favourite is still SiteGround, their support actually works, are GREAT at security, have multiple data centres around the world (including in London), and are officially recommended by WordPress (they can, of course, tackle any CMS you throw at them), they’re a true no-brainer, check out our review here. Still interested in 1&1 for some reason, keep reading below. The company was founded in 1988 by Ralph Dommermuth and is owned by United Internet, a German Internet company. With employees of over 7000 people, 1&1 is one of the largest web hosting companies in the world. It has offices in 10 countries and data centres located in Europe and Kansas. 1&1’s headquarters is located in Montaubar, Germany. The company has reached several milestones since its inception. By 2000, it entered the UK web hosting market and opened an office in the UK. It started to directly serve customers in the United States by 2003 with headquarters located in Chesterbrook, Pennsylvania. And in 2013, it expanded its services to Mexico. 1&1 provides a variety of products and/or services including domain name registration, web hosting on Linux and Windows platforms, email hosting, website builder, eCommerce, and server solutions (e.g. dedicated, virtual, dynamic cloud servers). The company has over 70,000 servers that operate in data centres located in Europe and the USA. According to the company, they host about 19 million domains and transfer over 20,000TB of data per month. The cheapest plan is called the Basic plan and gives you a total disk space storage of 100GB. This means you have 100GB worth of data in your hosting account. You are also allowed one website in a specific hosting account. The cheapest plan costs £0.99 per month for the first 12 months. It will then cost £4.99 per month after the first year. With this plan, you get a free domain in the following extensions, .com, .net, .org, .info, .biz, .website, .club, and .me. The Basic Plan gives you the said Level 1 of Scalable Performance. This means you are guaranteed a top performance of 2.5GB worth of RAM. This equates to about 100 visitors per minute or a total of 144,000 visitors per day. You can scale the performance of your website to up to level 5 costing you about $1.99 per month per level. Level 5 will give you 19GB worth of ram and up to 5x more processes per minute. This is from 300 processes per minute in the 1st level to about 1,500 processes per minute in the fifth level. The Basic plan also gives you a free SSL Wildcard Certificate. This means you are given the option to protect your customer’s sensitive information and increase your rankings in search engines like Google, Yahoo!, and Bing. Security features are included in the package as well. Daily backups of files and databases are included in the Basic plan. It also includes features such as Data Recovery and DDoS Protection with the latter features giving you the ability to protect your site from cybercrime and hackers. It also has the Geo-Redundancy features which means you have duplicate data in different locations to eliminate downtime. The Basic plan also offers 1-click installation of over 70 applications. WordPress, Joomla!, Drupal, Magento, and TYPO3 are also supported by this plan. They also provide WebApps, HTML code snippets for over 100 popular widgets. NetObjects Fusion 2015, a software used to create web pages, is also supported. When it comes to development, databases, and scripts, the Basic plan supports a variety of stable PHP versions. It also supports Perl, Python, and Ruby. It supports MySQL5 databases and the Zend Framework. One good thing about the cheapest plan is the ability to have 500 email accounts worth 2GB each. The said email accounts are useful especially if you want multiple people to get messages from website viewers. Email forwarding, anti-phishing, and anti-spam features are included too. SiteAnalytics and Google Sitemaps are features included in the plan as well. You are given a $100 Bing Ads Starting Credit which is useful especially if you want to incorporated ads in your marketing plan. Finally, you are given a 30-day money-back guarantee if you are not satisfied with their services. Their help centre is actually a self-help database of information concerning their products and/or services. With the Community Center, you can create an account and talk to other users as well as company representatives regarding certain problems you might encounter. When we compare them to most competitors, they’re usually the most affordable. With the cheapest plan, you can get a free domain name registration with a selection of multiple extensions such as .com and .net. This is free for the first 12 months only though. The following cons are taken straight from the negative user reviews online. This is by far the biggest complaint. It seems like most people are pretty angry about the support staff. From rude support, to staff that can barely speak English, to support tickets that just go unanswered. Unintuitive and difficult to get your head around is the general gist here. As summarised in the intro, I would avoid 1&1 at the moment, while their core services seem ok-ish, their reputation is so bad that I would strongly recommend looking at alternatives. 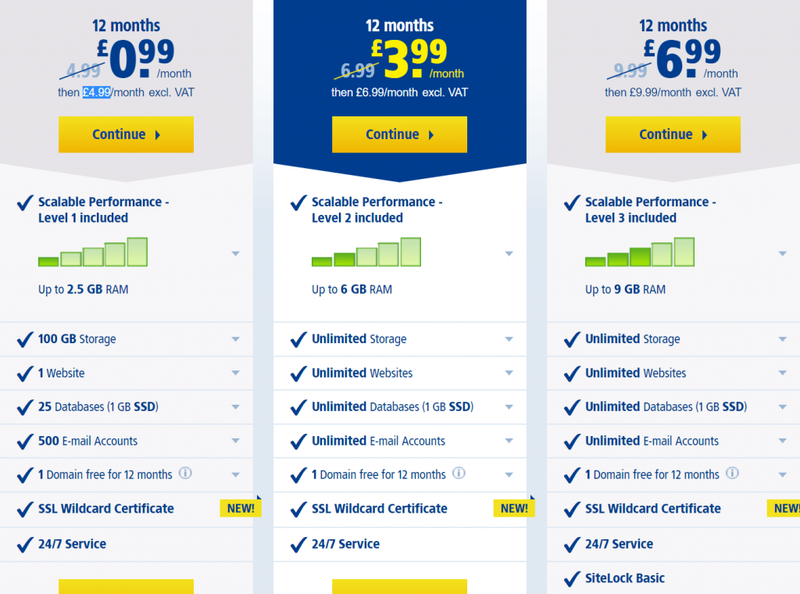 If you want a decent web host, check out the review of our favourite host, SiteGround. Want to leave your own review about 1&1? You can do it through the form below.